AC Milan coach Gennaro Gattuso has provided the latest news on his injury concerns ahead of his side facing Juventus in Serie A on Sunday night. The Rossoneri are on a positive run of form having won their last three consecutive games, but injuries could be set to take their toll. 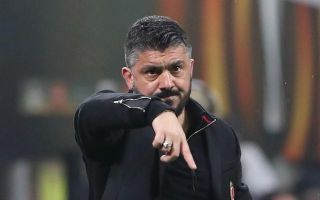 While they face Real Betis in the Europa League on Thursday night, they’ll host Juventus at the weekend and it appears as though Gattuso is at risk of facing some difficult selection decisions. As noted by Calciomercato, the Italian tactician confirmed at his press conference on Wednesday that long-term absentees Lucas Biglia and Mattia Caldara will play no part against Juve, while he doesn’t expect Giacomo Bonaventura to return from his knee problem in time. However, in more positive news, he was a little more encouraging on the recoveries of Davide Calabria and Gonzalo Higuain, as he suggested that both could recover in time to face the Serie A champions. It remains to be seen if that’s the case, with Higuain in particular crucial to Milan’s chances of securing all three points given that he’s scored seven goals in 12 games to start the season following on from his summer arrival from the Turin giants. Having fought their way into the top four, Milan will hope that injuries don’t now derail their push for Champions League qualification midway through the campaign. To make matters worse, the injury concerns are all in areas in which they’re a little light in quality depth, and so it will undoubtedly be a real test of their resilience moving forward. Nevertheless, getting Calabria and Higuain back for the weekend will be a welcome boost for Gattuso as he looks to keep their winning run in the league going.